Halfords Yuasa Racing team-mates Gordon Shedden and Matt Neal are eager to confirm their pre-season potential when the 2017 Dunlop MSA British Touring Car Championship roars into life around Brands Hatch's short Indy Circuit next weekend (1/2 April). 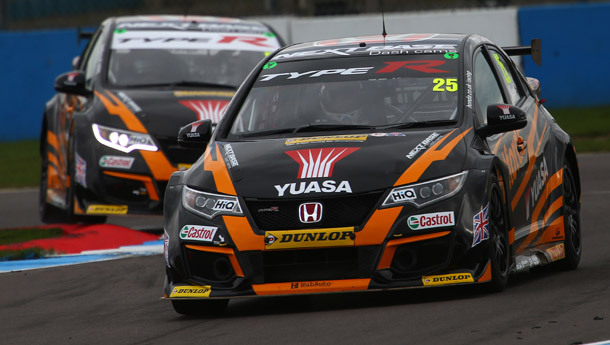 Shedden concluded the 2016 campaign by fighting to his third title in the UK's premier motor sport series in dramatic fashion, with Neal similarly going into the thrilling season finale with a very real shout of lifting the laurels. The Honda Civic Type R has undergone a comprehensive development programme over the winter months, with particular attention being focussed on the new Dunlop Sport Maxx tyre that will be introduced this year. Shedden and fellow three-time BTCC champion Neal have been out on-track at Parcmotor Castellolí in Spain and various British circuits in recent weeks, and both men are in positive mood as the start of the season speeds rapidly into view. "Testing has gone well. There has been plenty of learning with the new Dunlop tyres, but I think we're getting our heads around it all and I'm in a reasonably happy place right now. The week in Spain was really beneficial and highlighted a few things we needed to work on early in our preparations. That ensured we were on the right track by the time we got back to the UK and the car feels good. It actually feels different to last year - the tyres have had more of an effect than I'd expected, to be honest - but we seem to be increasingly unlocking the little Civic Type R's potential. Of course, the one thing we don't know at this stage is how quick everybody else will be, but what's for sure is that it's going to be insanely close in qualifying at Brands Hatch with the whole field on zero ballast - you're going to need to absolutely nail your lap if you want a good starting position. I really believe the difference between first and last on the grid this season could be the smallest it's ever been. The quality stretches further down the field than in recent years, meaning it will all come down to hundredths - if not indeed thousandths - of a second." "This is the first year in a while that we will arrive at the opening round with a sorted chassis and sorted engine, which bodes well. In recent seasons, we've tended to be a bit lastminute.com because we've always had something new to introduce. That said, the calibre of the field in 2017 will certainly make our lives harder! There are some very good driver and car combinations out there, which is what everybody wants to see - if the BTCC wasn't a challenge, we wouldn't be here. Everybody is going to have good and bad weekends - that's inevitable, particularly this year as getting to grips with the new Dunlop tyre has been a learning curve for us all - but our goal is to be as consistent as we possibly can be over the course of the campaign. I never like to be confident, because I think confidence breeds complacency, but I'm feeling good and three solid results at Brands has to be the goal; of course it would be lovely to come away with a win or even a podium, but points in the bag are the main priority. I think we should be in with as good a chance as anybody else."